#ISeeChange: Is climate change responsible for SoCal's mosquito problems? 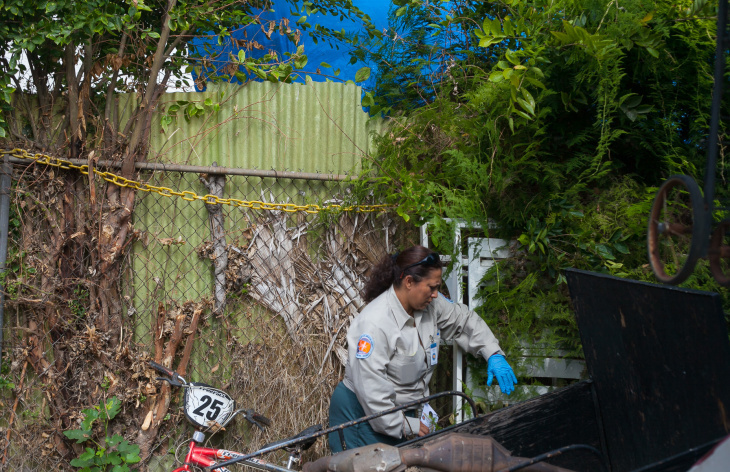 Maria Rodriguez, a mosquito control technicians from the Los Angeles County Vector Control District inspects a backyard Commerce to looks for invasive mosquito species such as the Aedes Aegypti, (yellow fever mosquito), on Wednesday, July 29, 2015. The mosquitos only require a small amount of water to breed in, and bite during the day. John Ortiz, a mosquito control technicians from the Los Angeles County Vector Control District, fogs a backyard after finding invasive mosquitos from on Wednesday, July 29, 2015. 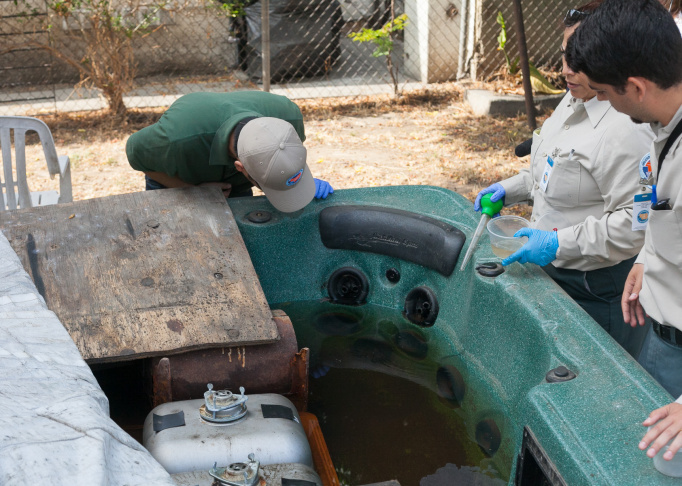 Levy Sun (left), a public information officer and Maria Rodriguez and John Ortiz, mosquito control technicians from the Los Angeles County Vector Control District, uncover a hot tub to find it full of mosquito larvae, of an invasive mosquito species on Wednesday, July 29, 2015. 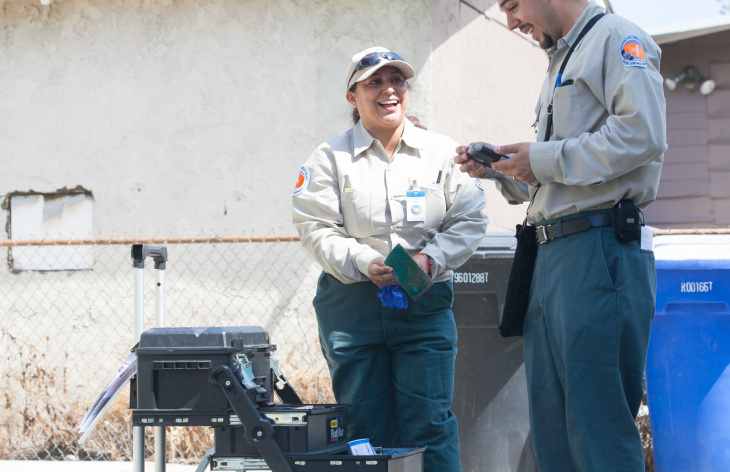 Maria Rodriguez and John Ortiz, mosquito control technicians from the Los Angeles County Vector Control District inspect residential areas in commerce to looks for invasive mosquito species such as the Aedes Aegypti, (yellow fever mosquito), on Wednesday, July 29, 2015. 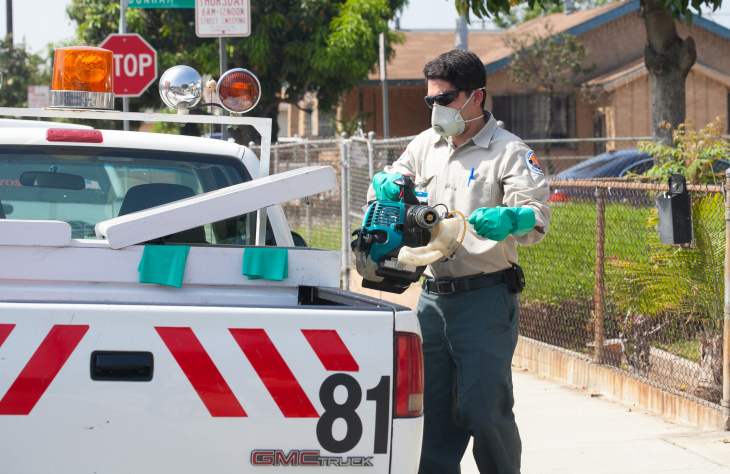 The Los Angeles County Vector Control District inspects residential areas on Wednesday, July 29, 2015, where invasive mosquito species, such as the Asian Tiger Mosquito (Aedes Albopictus) and Yellow Fever Mosquito (Aedes Aegypti) have been found. 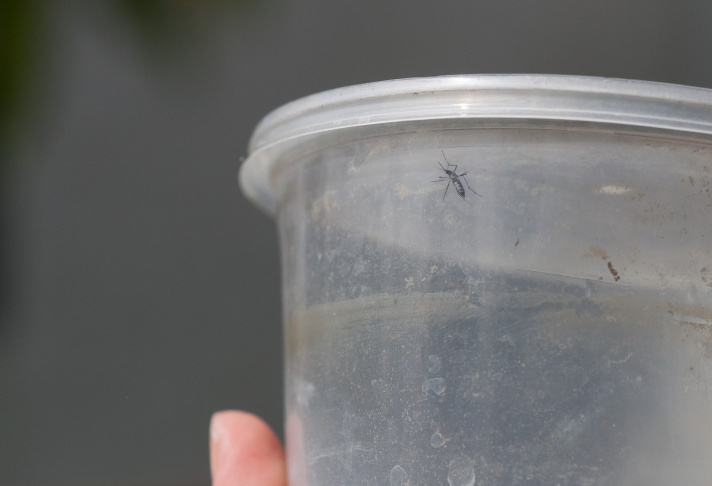 An adult mosquito from the invasive Aedes family found in the backyard of a home in the city of Commerce by mosquito control technicians on Wednesday, July 29, 2015. 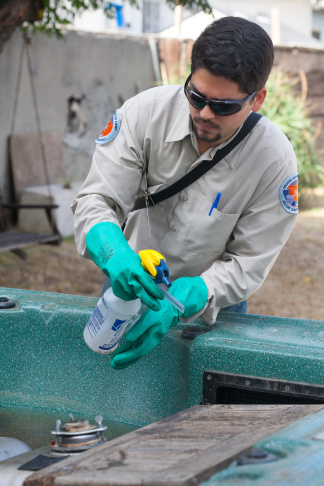 John Ortiz, mosquito control technician, sprays an oil solution on the surface of a hot tub that has been contaminated with mosquito larvae on Wednesday, July 29, 2015. The solution prevents the larvae from coming to the water surface to get oxygen, and eventually all the larvae in the water will die. 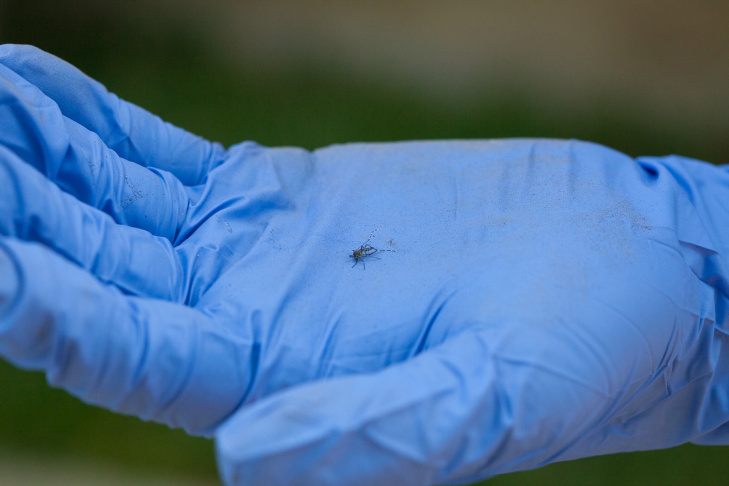 The Los Angeles County Vector Control District has been insepcting areas for invasive mosquito species such as the Aedes Aegypti, (yellow fever mosquito). Over the last several months, KPCC has been asking you to share observations about your environment for a project called #ISeeChange. The goal? To have you-our audience-help us look for possible signs of change, climate and otherwise, in your backyard. We collect your observations, look for patterns and then share them with scientists to get their take. In these dog days of summer, we’re following up on some of your favorite summer complaints: bugs and heat. Learka Bosnak, a resident of Los Angeles, likes to spend time in her backyard during the summer. When she does, she says, she now finds herself using a blanket to cover her entire body — a novel effort to prevent bug bites — and one she didn't need to worry about not too long ago. Bosnak is not the only one who wrote in to us with observations that the number of bug bites they receive seem to be increasing. Levy Sun, a spokesman for the Greater Los Angeles Basin Vector Control, says it’s hard to know if mosquito numbers are growing. County mosquito technicians set traps every year, but there’s no historical census or population estimate. Invasive Aedes aegypti and Aedes albopictus mosquitos may have come here through global trade or travel. 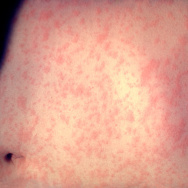 They could spread yellow fever, dengue fever, and chikungunya. 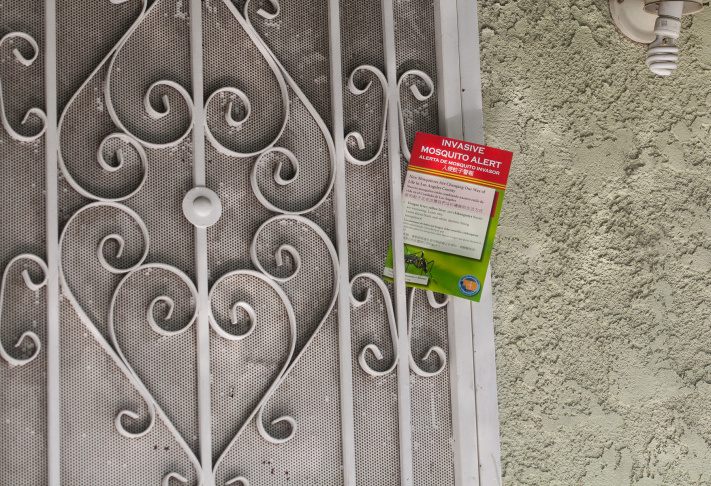 So vector control has tailed them into the L.A. area — to communities including Whittier, Pico Rivera and Commerce — where technicians say they’ll find the mosquitos at one out of every three houses. Asian and Australian mosquitoes only need a capful of water to breed in, so the drought isn’t slowing them down, according to Vector Control officials. “We used to say a season is summer, but because of these mild winters, mosquito season is yearlong practically. We don’t rest.” said Sun. So controlling the mosquitoes becomes harder because their peak season is growing. Mild winters are associated with climate change in California. Like most urban centers, greater Los Angeles temperatures have risen in the last century — by about 5 degrees. During that time, cities' populations swelled and became more dense. 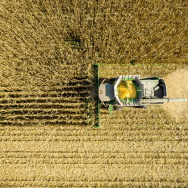 Forests and fields were paved over and covered with concrete, which helped fuel the rise in temperatures. Hall’s team is predicting that climate change will warm the L.A. region another 4 to 7 degrees by 2100, and some places will get hotter than others. So, not only are there more kinds of mosquitoes here, but warmer temperatures will enable them to thrive. Learka Bosnak knows her outdoor blanket strategy only goes so far. “I just put screens on my whole house,” she said. She’s not the only one adapting to warm weather and the bugs they bring. Kenny Tashman runs a hardware store in West Hollywood. His screen business has been booming as Southern Californians — who like to open windows to cool their homes — respond to breeze and bug problems. “I can tell — by the amount of people crying to me about when their screens are going to be ready — when it gets hot,” he said. Tashman's business is likely to keep booming as the number of days of extreme heat rises. UCLA scientists are predicting climate change will give the L.A. region 3 or 4 times as many of them as we have now. But Tashman says he’s ready: energy efficient windows can keep out the heat and, of course, the dreaded mosquitos. 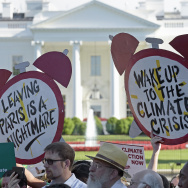 #ISeeChange is a national effort to track how climate change is affecting our daily lives. Notice any bugs in your backyard lately? Wondering why you're seeing coyotes where you don't expect? Seen changes in your favorite tide pool? Snap a picture and tag it @KPCC and #ISeeChange on Twitter or Instagram, let us know through our Public Insight Network, or post your questions on www.iSeeChange.org. Then see what others have found and observed in their environment. #ISeeChange: Could San Francisco's famous fog disappear? #ISeeChange: Are sphinx moths common in the high desert?